Before 'Josie and the Pussycats' graced the airwaves in 1970, it was a very different story. Under the title 'She's Josie' (or sometimes just 'Josie'), 'Josie and the Pussycats' was originally an Archie Comics series about a girl named Josie (based off creator Dan DeCarlo's wife) and her day-to-day life with: her best friends, the sarcastic Pepper, and the gorgeous Melody. Her hippie love interest, Albert. And the two stuck-up (and rich) Cabot siblings: Alexander and Alexandra. Some stories were as normal as the gang going bowling, then there were weird/not very normal stories like Alexander taking Melody on a submarine ride. In other words, it was similar to the Archie comics we know today except with a more female-focused cast/stories. Archie Comics had given Filmation the rights to create an Archie cartoon and a Sabrina the Teenage Witch cartoon. As it turns out, 'The Archie Show' became a huge hit. "Sugar, Sugar," as seen above, hit the #1 spot on the Billboard charts in September 1969. At the time, Filmation was Hanna-Barbera's biggest competitor on the cartoon market. Hanna-Barbera watched them almost obsessively - everything Filmation did they had to do too. This led to Hanna-Barbera's quest to create a teenage-band show of their own. After acquiring the rights to 'She's Josie,' Hanna-Barbera and other Archie Comic employees, including Dan DeCarlo, set to work to give Josie her own band. Hanna-Barbera came up with their idea: 'Josie and the Pussycats' would be about Josie and her band (with the Cabot siblings as their managers) traveling the world to perform while encountering James Bond-like villains. 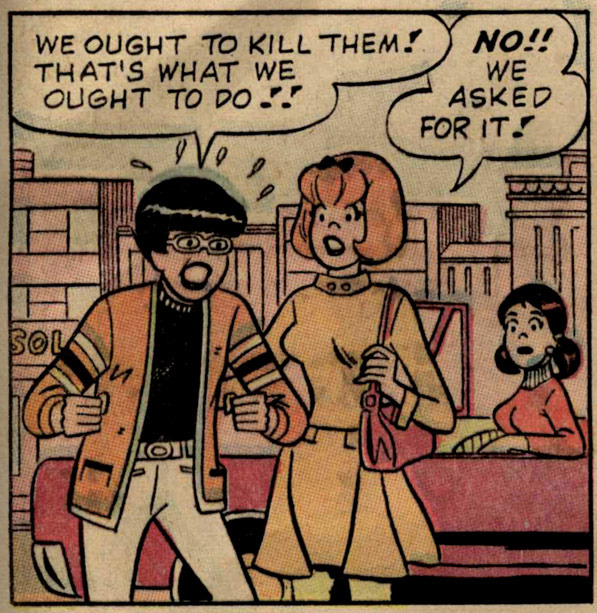 The band would consist of: Josie, Melody, and a new African-American character, Valerie (I'm assuming Hanna-Barbera, for the first time in cartoon history, included a female African-American character to compete with Filmation's first African-American male character in 'The Hardy Boys' cartoon. Because, it turns out, they weren't really excited by the idea of a female African-American character in the show - but that's another story for another time). Another new character, Alan, was set to be the sort-of team leader and equipment boy. Alexandra remained mostly the same, except instead of being crazy for Albert, she was now crazy for Alan. Alexander was turned into a huge coward (like Shaggy - and voiced by Casey Kasem too!) rather than an arrogant, ultra-horny teenager as he was in Archie Comics. Sebastian was in the comics at that point as well, except he pretty much did nothing and rarely appeared in the comics - he was just there to give Alexandra her witch powers. Yes, witch powers. And yes, it's another long story for another time ha ha ha. Well now that Hanna-Barbera was changing everything, what did it mean for the still-running 'She's Josie' comics? The changes happened suddenly and with very little explanation. Pepper, Albert and the other colorful side characters completely vanished in 1969 when 'She's Josie' changed into 'Josie and the Pussycats.' Two different stories introduced Valerie (she was Alexandra's replacement when Alexandra quit when the band didn't change its name to....uuugghh....'Alexandra and the Cool-Time Cats') and Alan (he basically appears playing a guitar and Alexander gets massively jealous when Josie starts flirting with him, but he ultimately hires him after getting tired of lugging all the band equipment). There was no explanation to why the other side characters were suddenly gone and why Josie and Melody suddenly displayed musical talent except for an announcement that the new 'Josie and the Pussycats' cartoon was coming soon. When 'Josie and the Pussycats' premiered in 1970, the cartoon itself was a hit. 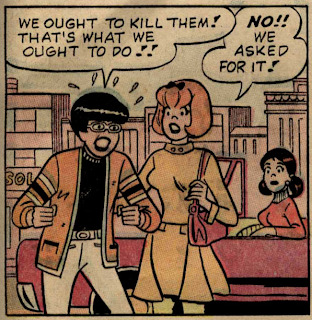 However, because the tragic handling of its soundtrack (4 songs that weren't even in the cartoon were only available through a Kellogs promotion, and there was absolutely no promotion of the soundtrack by Hanna-Barbera, Archie Comics, or Capital Records) none of the songs even made it to the Billboard charts, unlike 'The Archie Show' songs. Pepper was a strong, sarcastic, and often temperamental character who was 1,000% loyal to her friends. Unlike the perfect good girl Josie and the gorgeous Melody, normal girls like me could really relate to her. 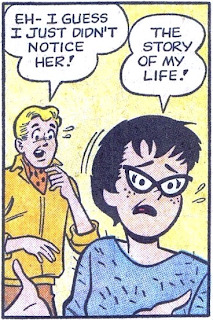 It is nothing short of a tragedy that she is forgotten in Archie Comics history. However, a part of her lives on in comic book Valerie - the part that wasn't afraid to go nose-to-nose with bullies and did anything for her friends. Check out my 'Hell Yeah!!! Josie and the Pussycats' Tumblr blog HERE for random pictures and fun from my 'Josie/Josie and the Pussycats' comic collection. That's sad. Whenever I read the old Josie comics, I always thought Pepper was the most cute of the pair. It's a pity that they haven't thought of bringing her back with the mass revamp of the characters in the last year or so.